World Report: Gila Svirsky, "No news is bad news: The importance of getting information to those who choose to ignore it." Gila Svirsky, "No news is bad news: The importance of getting information to those who choose to ignore it." I was listening to the radio interview of two teens from the south of Israel, both of whom had been living under intolerable conditions for several weeks, caught in the crossfire of the adults. But Israelis are still repeating the mantra that turns my stomach: The IDF is the most moral army in the world. "Oh my family never watches the foreign TV stations," said one. "They're not as accurate as the Israeli news." "My father forbids it," said the other. "It could be demoralizing." * children were found cowering in their home near the dead bodies of their parents, probably for days, as ambulances could not reach them, despite strict international laws about the free movement of medical crews. But Israelis hear only the Israeli news. So what does my neighbor say to me yesterday? "Israel has the most moral army in the world. What other army would drop leaflets warning civilians to leave so they won't be hurt by shelling?" "The weapons used by the Japanese military authorities in order to extend this hopeless war will be completely destroyed by the US Air Force. However, bombs cannot see, so we do not know where they will land. As you know, we Americans are a humanitarian people and we do not want to injure innocent people. Therefore, please evacuate these cities." "As a result of the acts undertaken by terrorists in your area against Israel, the IDF is forced to respond immediately and take action in this area. For your own safety, you are asked to leave the area immediately." Israel also dropped leaflets urging Gazans to phone in information about the ocations of Hamas leaders and amunitions storage. Needless to say, there is nowhere to go. Gaza is a tiny area - 10% the size of Rhode Island - densely occupied, and all the borders are sealed shut. something. B'Tselem even took the unprecedented step of issuing a call for a cease fire [http://www.btselem.org/english/]. All have done important work in getting the message out to Israelis. Last but not least, the peace organizations continue raising their brave and lonely voices to the ongoing vilification of patriotic passersby and motorists. 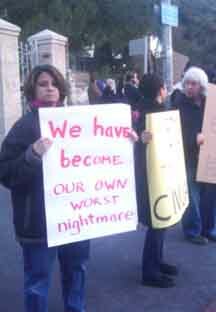 Here's what I wrote on my sign yesterday: "We have become our own worst nightmare." Most passersby didn't get it.